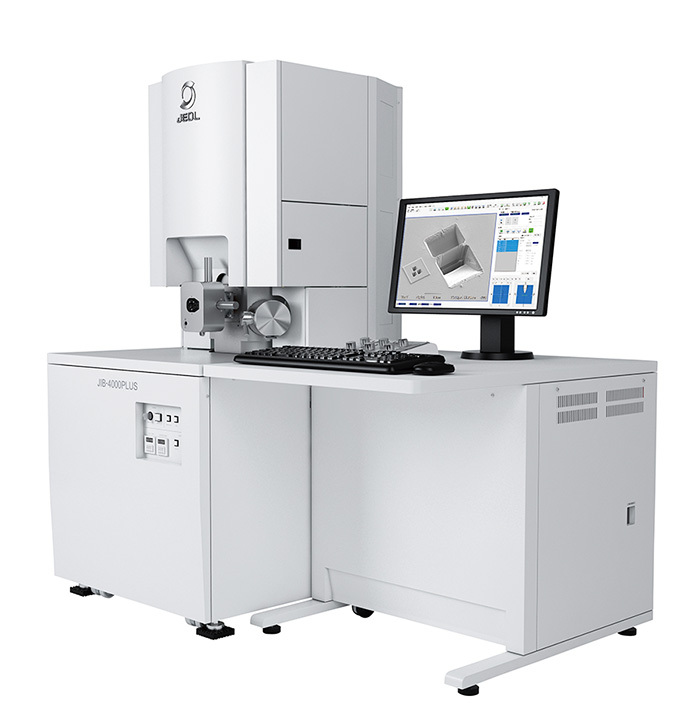 The JIB-4000PLUS can use an optional "STEMPLING," an automatic TEM specimen preparation function. This new function enables anyone to easily prepare specimens. Since the function also enables automatic preparations of multiple specimens, unattended operation overnight can be made for preparing large amounts of specimens. These features lead to a dramatically improved throughput. The JIB-4000PLUS incorporates a High Power FIB column with a maximum ion beam current of 60 nA. Furthermore, the system can increase a beam current up to 90 nA (optional), thus achieving a shortened specimen preparation time and a larger-area specimen preparation. The JIB-4000PLUS comes with a function of serially-sliced cross section imaging for 3D observation. Although the JIB-4000PLUS is a single-beam FIB system, 3D observation can be made using SIM image. The optional 3D reconstruction software enables the 3D reconstruction of the acquired multiple cross sectional images, allowing for displaying the 3D image at various angles. The JIB-4000PLUS accommodates a variety of attachments available to support the operations of the system. The attachments include the side-entry goniometer stage for allowing direct loading of the TEM specimen holder, the CAD navigation system useful for circuit modifications, the vector scan system effective to mill a specimen with characteristic shapes, and additional gas injection systems. By adding the appropriate attachments to the JIB-4000PLUS, the system can support applications beyond specimen preparation. Copyright © JDC All Rights Reserved.